The Next Best Thing in Skin Care Memebox was released after a little lull - which has now turned into a huge lull on their side - so I bought the box despite already having enough Korean skin care products to use for a few months. 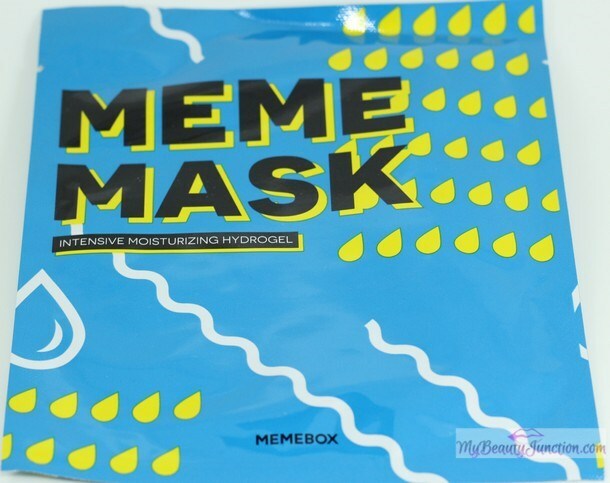 Thankfully, most Memeboxes contain products expiring in 2016 and beyond. The description said that this box would contain all the latest trends in Korean skin care, including new packs, creams and masks. I expected it to be another version of the OMG boxes, but with innovative products rather than weird ingredients. Read on for my review and unboxing of the Special 81: The Next Best Thing in Skin Care beauty box from Memebox. Eight products! What more could I ask for? Read on for my first impressions of each product. The paraben-free egg and mango sleeping packs come in the cutsiest packaging and work on repairing dry skin overnight. My skin is at its flaky worst right now, and I also have major acne thanks to a Balance Me product. Needless to say, these contain extracts of egg and mango. I have used egg yolk as a pack on my skin before and it worked very well, though getting it off was a pain. The egg pack here is a lot easier to remove. Look at the inside of these packs! There is enough for two uses each. I love that the egg pack contains white and yellow, while the mango pack contains what looks like seed and pulp. I am going to buy more of these! They also come in "pearl" and "avocado". As Gollum would put it, we wantssss them all, precious. I tell you, the products in this box are so innovative! This serum contains ice fig, hydrolysed collagen and ginseng callus extracts. The best part is, the bottle contains a holographic double helix submerged in a gel, which was a pain to capture in photographs. The holo part pumps out along with the gel and is to be applied to the face twice daily. The liposomes deliver intense nourishment to the skin and make it firmer and glowing. I have been using the serum for about a week now and it has not added to existing breakouts. A wipe that does not cleanse, refresh or remove makeup, but hydrates and conditions the skin. Whatever next! It is to be used on cleansed skin, and contains centella asiatica, aloe vera, licorice extracts and BHA salicylic acid. I have not begun using these as my face needs to resemble skin and not the surface of the moon before I begin swiping to and fro with wipes of any sort. How cute is this tin? This is a multipurpose balm that can be used on the lips, face, elbows, knees, body... on dry, parched skin anywhere. It contains green tea seed oil, jojoba seed oil, argan tree kernel oil, and 30 essential oils. Anything with oil is not going anywhere near my face right now. But the weather is very dry and I have a bit of travelling coming up in January, so this is going into my travel bag. There are three types of packs in this set of six - one for revitalising, pore and oil control and increasing elasticity. What you do is, empty the contents of the pack into a bowl of water, mix and pat into the face for 30 seconds. Do not rinse off. I have used just one so far and it was fun to try out and softened the flakes on my face nicely. For about 24 hours - they reappeared again, thanks to all the anti-acne products I am using. This gel-like cream contains collagen capsules, hyaluronic acid and adenosine. It absorbs quickly and does not leave my skin greasy. It can be used on sensitive skin. I have only tried it a couple of times; will share my thoughts after giving it a decent run. This is Memebox's own brand. The sheet is different from the usual sheet masks and does not feel like cotton - I get what they mean by "hydrogel". How did I like it? It was very cooling and intensely hydrating. It was lighter than other sheet masks I have tried, enough to leave on overnight and fall asleep. Will I repurchase? I have two more left, so I am wondering whether to get more of these with my points. The Next Best Thing in Skin Care Memebox is an improved version of the OMG and Cute Wishlist boxes. It contains innovative products in cute packaging and keeps up with latest trends and developments in Korean skincare. This is the best Memebox I have seen in a long while, after the chocolate-themed boxes. Everything is full-sized, useable, innovative and very much in keeping with the theme, and there is some cute packaging in there, and there are eight products. What more can you ask for from a Korean beauty box? I wish they would release more boxes such as this one. You can check out restocks and any available boxes here and Memeshop products here. Remember, code HT3BPO gets you $5 off orders of $30 and above, only until the end of the month!